Follow @NorthPoleHoops Twitter, IG, FB for the latest in Canadian Basketball action from high school to the PROS! 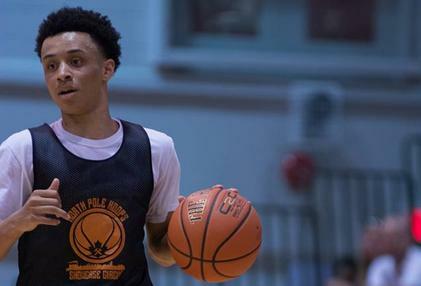 Jaelin Lliewlyn was recently named MVP of the Hamilton NPH Showcase–the first time in camp history where an underclassmen earned this upperclassmen honour. The Mississauga, Ontario point guard comes from a strong basketball bloodline, with father Cordell “Bobby” having played NCAA basketball at both Wake Forest and Rhode Island and has been instrumental in molding his son on and off the floor. High character, humble and poised—these intangibles will ultimately distinguish himself at the highest of levels. He brings a quiet confidence that you don’t see coming as an opponent; Athletic, skilled and is a two-way player with impressive body control, feel and craft. This Cadet National team member is the next high level lead guard that will come out of Father Goetz, after the likes of Tut Ruach, David Tyndale, Naz Long, Eli Long, Cody John, and Freddy Ibrahim. Llewellyn is a special talent and we don’t use that word lightly.